Organic. A heady mix of Raw Cacao and Tahini, gives you a delicious chocolate flavour with all of the health benefits of Tahini which is made from ground Sesame seeds. Made from scratch using natural, organic ingredients both locally and imported. Has tons of health benefits. If you love having something decadent and delicious for breakfast but don’t want all that processed white sugar and additives then nut and seed butters and spreads are the perfect choice. Raw Cacao is raw chocolate, and the most loved of all of the superfoods. It is the raw chocolate bean that all chocolate in the world is made from. Raw Cacao beans come from the Theobroma Cacao tree, a small evergreen tree grown in Mexico and South America. Raw Cacao has been used for thousands of years. It was first used in Mayan times and where it was regarded as a culinary treasure to be named as the "Food of the Gods" by the Aztecs because of its high nutritional profile and exceptional flavor. Ever since then Cocoa has been used across the world to make chocolate and now only recently are we able to eat it in its natural form again as Raw Cacao. If you’ve ever visited the Middle East or love Middle Eastern cooking then the chance are you’ve already tasted Tahini in some recipes. It’s widely used to make sauces and dips, most famously every vegetarians favourite dip...humus. Tahini is a paste made from ground sesame seeds, and has been used for years in Middle Eastern cooking, adding flavor and texture and a great source of nutrition. It is most widely used to make Mediterranean dips and salad dressings, and often mixed with lemon juice and water to make it thin and runny. It is often used now in raw food cooking as it add flavour, taste and binding abilities to energy balls and cake crusts. Tahini has many health benefits, including healthy macronutrients and a variety of good-for-you vitamins and minerals. Tahini provides an excellent source of the essential fatty acids, omega-3 and omega-6. It also contains necessary nutrients such as vitamin B1, manganese, phosphorous, magnesium, iron and copper. A tablespoon of tahini contains one gram of dietary fiber and three grams of protein. These healthy fatty acids omega-3 and omega-6 help the body’s nervous tissues to develop which improves brain health. They also assist with optimizing emotional health and cognitive brain function. The development of Alzheimer’s disease can be slowed down by consuming these healthy fatty acids, and both memory and thinking are enhanced by the consumption of Omega-3. Brain and nerve function are enhanced by manganese. Another of the many tahini health benefits is that it includes copper, which is known to help reduce swelling and relieve pain. Its anti-inflammatory effects can be used to treat the symptoms of rheumatoid arthritis as well as help to expand the airways in those who suffer from asthma. Specific enzymes in the body’s immune system are also assisted by copper in order to utilize their antioxidant properties. 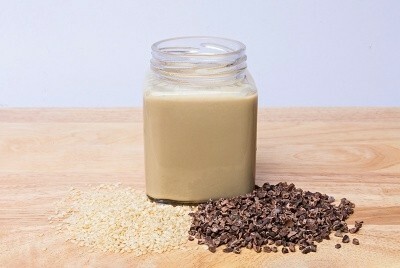 Phytonutrients are also included in sesame paste, which helps to keep the liver from suffering damage from oxidation. Tahini health benefits include four important nutrients which provide support to your immune system, which include copper, zinc, selenium, and iron. Both copper and iron are included in enzymes that support the immune system and help to make white blood cells. Zinc is a nutrient that is necessary in order to develop white blood cells and support their function of killing germs in the body. Selenium is a nutrient that is needed to help the enzymes perform their jobs, such as creating antibodies and antioxidants, and for helping the immune system to work efficiently. A tablespoon of tahini contains 9-12 percent of the daily recommended intake of zinc, selenium and iron, and 26 percent of zinc. Tahini works well in sweet and savoury dishes. You can use it to make salad dressings, dips, to thicken sauces and make them creamy, and anywhere you want a creamy texture but without using dairy...tahini is your go to condiment! For raw food it’s sticky and helps bind cake crusts, energy balls, and can be eaten straight off the spoon when you want a quick yummy protein fix. Tahini will keep you going and keep the hunger pangs at bay!